Hooray! My Etsy shop reached 4,000 sales! I’ve been blessed and honored to make memory books for so many wonderful customers! Thank you for trusting me to make keepsakes for you, your family and your friends. I love my job! I recently created this airplane charm design for a pregnancy journal and then not long after received a request for it on a baby book. What hard-to-find design elements are you looking for? Contact me to talk about making your vision a reality! What a sweet boy with his baby book! This deer antler pattern is also offered with arrows instead of buffalo plaid. I’ve even made it with other accents, too. I’ve got plenty of options to customize your cover…contact me to get your book started! I love how this two-book set for baby twin sisters turned out! These books will hold sweet memories that will be treasured forever. This custom guest book was designed to match the Mommy-to-be’s shower invitation (inset). I am so happy about the way it turned out and the guest of honor is thrilled! My customer and her three granddaughters love nesting dolls. She keeps a set in her purse always available for play. Their baby sister will be the fourth and smallest nesting doll. I designed a custom charm and customized the pages, as well. She loves it! This custom charm was made for a dog-loving mama! 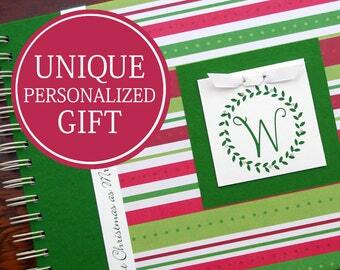 My customer told me that the gift recipient loves her journal! Do you have a theme you’d like to match? Contact me to create something special and unique just for you! New covers just listed! Choose the multi-colored hearts, sweet little foxes, the deer antlers with arrows, or find something completely different by browsing the shop. With so many choices, there’s sure to be something to fit your style. Each of my 6-year school memory books includes 60 fill-in-the-blank, journaling and photo pages. There are lots of journaling prompts and spots for photos, and sections are divided with pockets to store keepsakes. Select any cover in my shop! It's not too late to document your child’s school memories! Books can start at any grade and I have even created "catch up pages" in case you don't have all the details of previous grades, but would still like to include them. Convo me for more info! From Michelle M: “Love Love Love my new baby book! I couldn't find a twin baby book anywhere. I found this one and it's perfect. Great quality also so cute. Lots of room for photos and memory journaling.” And aren’t her twins just the sweetest!? This charm was a custom request from a mom to boy/girl twins. Coordinate your nursery and shower with Charmbooks’ keepsake pregnancy journals, baby shower guest books and baby books! Contact me to make books you and your children will treasure. Designed to match sweet little Karson’s nursery, this baby book + shower guest book will be a treasured keepsake for generations. I’d love to make a one-of-a-kind book for your little one. Send me a message so we can get started! Document your journey from bump to baby (or babies!) with a Charmbooks pregnancy journal. It’ll be a keepsake you’ll always treasure. Happy Mother's Day to all the wonderful Mamas and Mamas-To-Be out there! Just posted a wonderful mom video to my FB page (facebook.com/charmbooks). Head over to check it out…but bring some tissue! What’s more fun than celebrating one baby? TWO babies! Thanks to Misty for sharing photos from her twin baby shower! I’d love to coordinate a book for your special event! Send me a message so we can get started! This sweet boy is enjoying his baby book! Keep babyhood memories alive by ordering an easy-to-keep-up-with book from my shop. 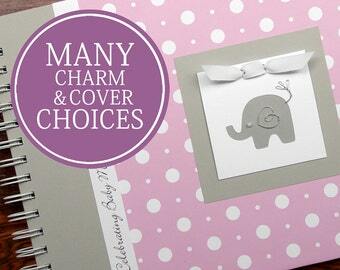 Take a look at cover options in my shop or message me to match your nursery. I’d love to custom make one just for you! Birthday books are a great way to remember the highlights of each of your child years! Ask your child interview questions each birthday, jot down your favorite memories and add photos to make this a treasured keepsake. Contact me for more info. Have a milestone anniversary celebration coming up? I can make this for any year! Fill it with memories from the anniversary couples’ many years together and you will have a cherished keepsake like no other. Contact me for yours! Sweet little animals make this baby girl book just precious. This cover can be made for any of my baby books: pregnancy journal, baby shower guest book, and baby’s first year book. Contact me to make one for you! Classic black and white stripes paired with a little bit of gold…I’m loving this combo. Let me know if you’d like this cover as a pregnancy journal, baby book, shower guest book or anniversary journal.